Yes, my blog is still alive and so am I.
I am not going to say I am sorry for being absent that long (although I missed my little blog) but I really had so much work that I just couldn't find the time or strength to write something with sense. And now I am back with hair products. 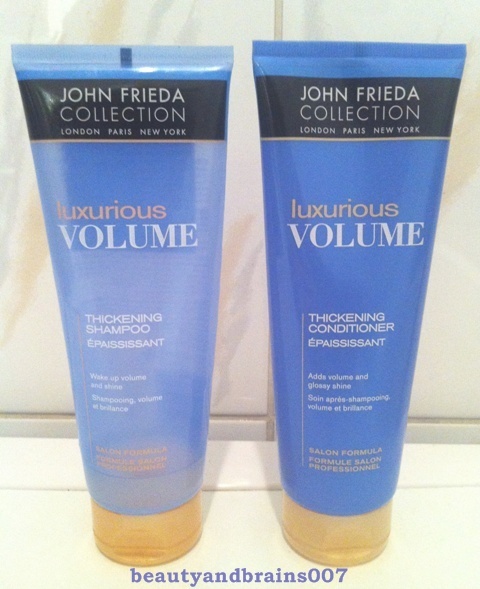 John Frieda Luxurious Volume shampoo and conditioner. As always I was seduced by the packaging. This beautiful blue colour with golden cap...Ugh... I loved it. They were calling me from the DM shelves in Brežice. Could it be possible that something so pretty can be bad? I certainly didn't think so. Both of these products should add volume (hense the name) and my long, straight, dense but greasy hair coluld use some volume. They both come in a 250 ml tubes and each tube costed me 6.50 Euros (about $9). They were marked down a little but in Croatia John Frieda products can be found anywhere (in drugstores and in highend stores). I'll start with shampoo. "It will start adding volume to your hair even during your shower. Of course it will be even more efficient if you use it continuously and combine it with luxurious volume conditioner." Those are the words of the manufacturer. Yeah. I don't think so. This shampoo isn't the worst shampoo that I came across but it is not by any means special. It will not get your hair squeaky clean and for this one, that would be a better option. I have a feeling that it leaves a film on your hair which makes it heavier and more prone to greasiness. Which in translation means that you can forget added volume, at least from my experience. And now....conditioner. Or as they say at John Frieda...especially light conditioner which starts the process of adding volume at the????????? You guessed it! At the bathroom while you are showering, leaving your hair volumized and shiny. And my answer to that is. YOU WISH!!! This conditioner will not do anything for your hair if you are looking for added volume. Your hair will be clean the next day (well you freshly washed it) but not volumized. But your second day hair will be in need for a wash up or favorite dry shampoo. I must say that I have greasy hair to begin with but these products weigh it down even more and I don't experience that with my Macadamia mask which is more like a deep conditioner. For combing out your hair it is so so. I've had better ;). The smell of both products is irritating non existent with a hint of something chemical. I don't like it!!! But did I use it up? Of course ;). It lasted me for 5 months but I finally used it up. Would I buy any of these products again? Not in a million years! I am sorry for all the negativity in this post, but since this is not a really affordable product I thought you should know my experience with it. I also tried John Frieda Go Blonder shampoo and conditioner and, although they didn't lighten my roots, they were better products, as plain shampoo and conditioner, than these two. What is your experience with John Frieda products?